I know there are many chocolate and peanut butter fiends out there and I’m not the only one!!! If that’s you….then read on, because this recipe is for you. These little mouthfuls of heaven came about as I was getting creative with what to take to an essential oils workshop last week. 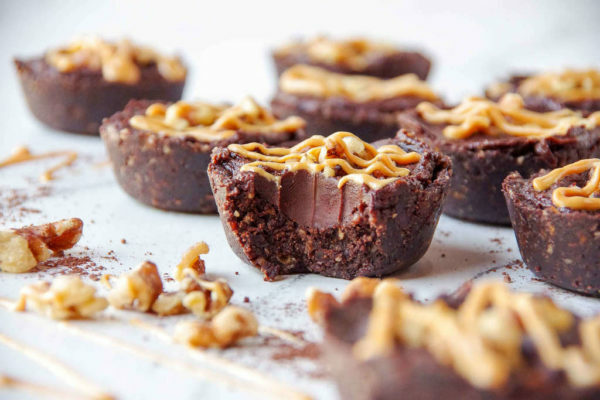 I started making bliss balls, but then thought, that’s boring…..so I made them into tart cases instead! I then played around with what to fill them with and since I was out of cashew nuts (my usual raw cheesecake filler), I decided to go decadent and do a chocolate peanut butter ganache. Creamy and smooth, I had to try not to eat the lot with a spoon while filling the tart cases. 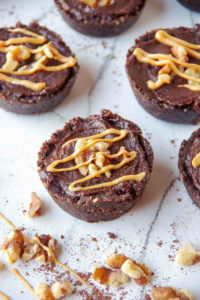 You’ll want to ensure you use smooth peanut butter for this one, otherwise, you’ll have chunks of nut in your filling which I guess could be nice, but I like a silky smooth filling myself. I added some chopped walnuts as decoration, but you could try some chopped peanuts to stay on theme or even some cacao nibs. 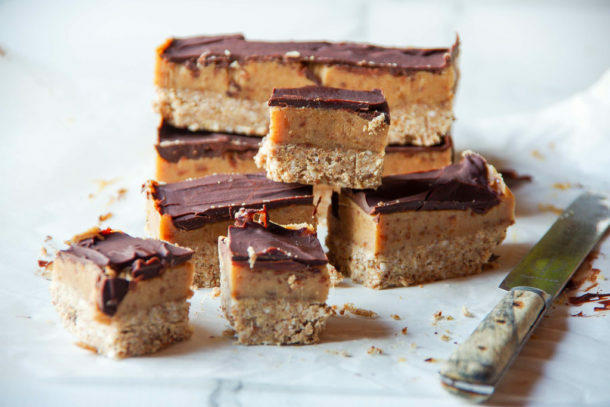 The peanut drizzle is again optional ~ but really takes it from yum to WOW in my opinion. Let me know in the comments if you give this a go and don’t forget to take a pic and tag me on social media. I just love seeing your creations! 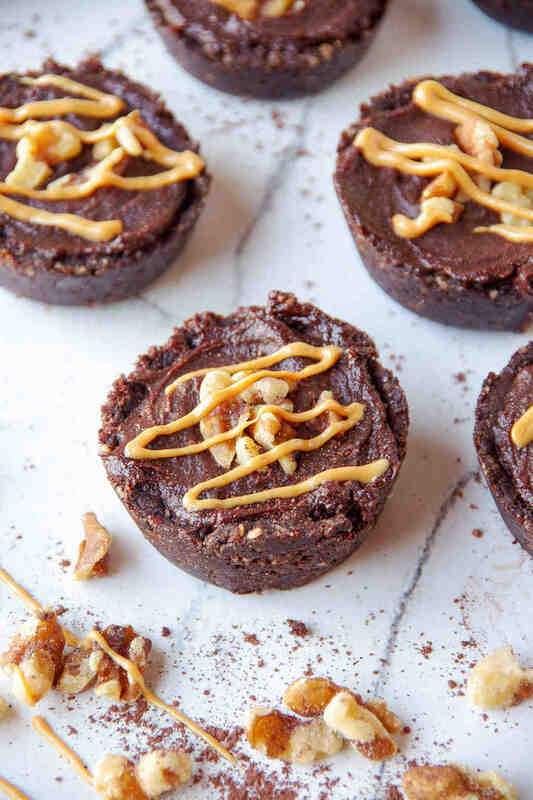 Easy but completely decadent, these delicious raw tarts will have peanut butter lovers going crazy everywhere! The night before, place a tin of coconut cream in the fridge. The next morning, place dates in a bowl and pour boiling water over them to cover. Leave for 30 minutes or more. Meanwhile. grease a standard size muffin tin and set aside. In the base of a food processor add almond meal, walnuts and cacao powder. Whizz to combine. Add soaked dates and peanut butter and blend until a sticky, firm ball has formed. Remove blade and place a heaped tablespoon in the bottom of the muffin pan. Use your fingers to press it downin the middle and mould it up the sides of thet tin. Repeat in the other muffin holes until all mixture is used up. Place in the fridge while you made the filling. Over a double boiler, melt the chocolate chips. Once melted add solid part of the coconut cream, peanut butter and coconut oil. Mix until creamy and smooth. Spoon a large tablespoon of chcolate filling into the cases and flatten with the back of your spoon. Sprinkle with chopped walnuts and return to the fridge to chill and harden. 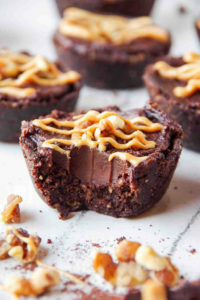 When you're ready to serve, remove the tarts from the tray, place on a plate and drizzle with some extra smooth peanut butter. Nicky on New Year, New You? 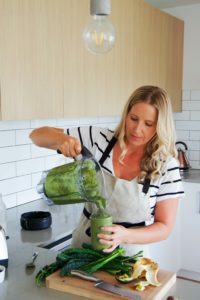 Kate on New Year, New You? Delivered Direct To Your Inbox!